SPE BOD meeting, all are welcome. The Akron Section of Society of Plastics Engineers, along with the TPE Special Interest Group of the SPE will be hosting the 13th Thermoplastic Elastomers Conference. The conference will be held at the Hilton Hotel in Akron, OH, September 18-20. This conference is highly oriented to the theme "innovation" as it will feature presentations that involve use of Bio-Renewable Materials, Wearable Technology, and of course, Materials, Modification and Development. Processing and scale-up will also be addressed. A half-day primer on TPE basics, taught by industry experts, will take place on the afternoon of September 18 as a prequel to the main conference. Click here for more information. There will be 2 keynote addresses. Quizar Hassonjee (President, Hass Tech Associates) will share information about Smart Textiles. Christine Hockman (Co-Director, Great Lakes Biomimicry) will address the subject of Biomimicry. There will be exhibitor booths and two evening networking socials. It's the final gathering of the season - a time to reminisce and honor those deserving of various awards and scholarships. Please join us at Firestone Country Club on Monday, May 21 to celebrate. Dr. Eric J. Amis, Dean of the College of Polymer Science and Polymer Engineering at the University of Akron, will be the keynote speaker. More information can be found in the newsletter. Social/networking/bar will begin at 5:30 p.m., with dinner at 6:00 p.m. and the program following dinner. Pricing for this session will be $30 for member/guest, $25 for retiree and $10 for students. New members will enjoy their first meeting at no charge. Please submit your reservation by noon on Friday, May 18 akronspe1@gmail.com or call Gary Taylor at 330-419-4380. Please be sure to include the company affiliation of each attendee including dietary restrictions. Reservations must be in by noon on Friday, April 6 and can be made to Gary Taylor at 330-419-4380 or akronspe1@gmail.com. Please be sure to include the company affiliation of each attendee including dietary restrictions. thermoplastic and thermoset plastic injection. Reservations must be in by noon on Friday, March 9th and can be made to Gary Taylor at 330-419-4380 or akronspe1@gmail.com. Please be sure to include the company affiliation of each attendee including dietary restrictions. Dr. Shengqiang Gao, Manager of Polymer Core, Medical Device Solutions, Cleveland Clinic will present "A Case Study of Plastic Material Selection for Medical Device Design, Prototype and Manufacture". Please see the attached flyer for more information. Social/networking/bar will begin at 5:30 p.m., with dinner at 6:00 p.m. and the program following dinner. Pricing for this session will be $25 for member/guest/retiree, $35 for non-member and $10 for students. New members will enjoy their first meeting at no charge. Please submit your reservation by noon on Wednesday, February 7 to mail@cmd-tip.com or call Dan Crist at 440-227-5424. Please be sure to include the company affiliation of each attendee including dietary restrictions. 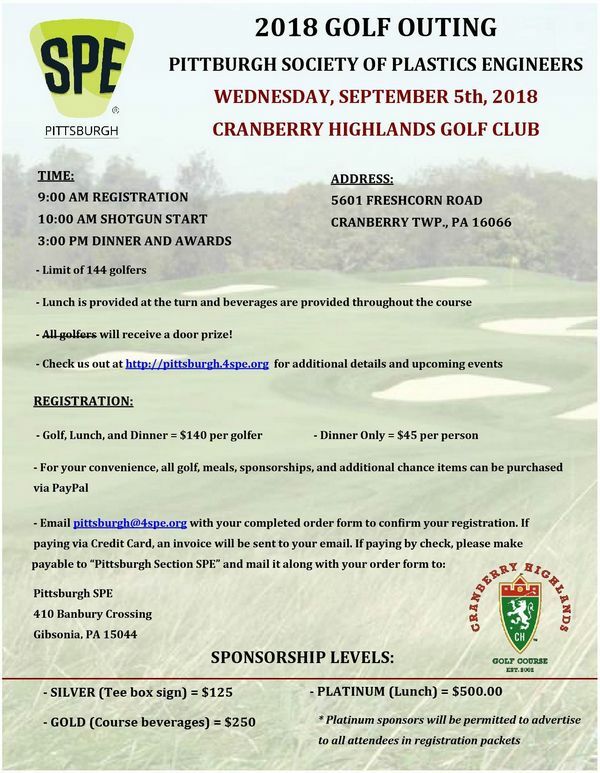 The Pittsburgh SPE section invites us to attend their technical meetings. With the continued growth in plastic resin production and conversion in North America, Baerlocher is continuing to invest in additive technology, production capacity and people to meet the increasing demand, higher quality requirements and lower costs needs of the industry. In 2017, Baerlocher announced an investment to bring a 50% increase in reaction capacity for production of metals soaps for plastic lubricants and stabilizers. Though followed with other investments in other Baerlocher production lines in the US in 2017, the installation and commissioning of the announced reactor has been the most challenging project since the plant was built in 2001. Ed Hall will highlight some of the challenges faced by the Baerlocher team to install this new line in a plant running 24/7 to meet increasing customer demand with strong capacity constraint in an environment lending itself to the creation of explosive dust. The team will use this experience to tackle an even greater project challenge in the plant and in the administration building in 2018. Reservations must be in by noon on Friday the 5th and can be made to Gary Taylor at 330-419-4380 or akronspe1@gmail.com. Please be sure to include the company affiliation of each attendee including dietary restrictions. In 1995 Ed graduated with a Mechanical Engineering degree from the University of Kentucky. He started his career with Hitachi as an automotive design engineer. Ed then spent time with Toyota-Denso as the North American Warranty Quality Manager before being offered an opportunity to serve in various commercial roles at GE Plastics. In 2007 Ed came on board with Baerlocher as the Sales and Customer Service Manager and since has held different roles within the company. Beginning January 2016 Ed took over as President and CEO for Baerlocher North America. Ed is continuing his education as a student at the Universidad de Navarra, Barcelona Business College graduate school and will graduate in 2018.